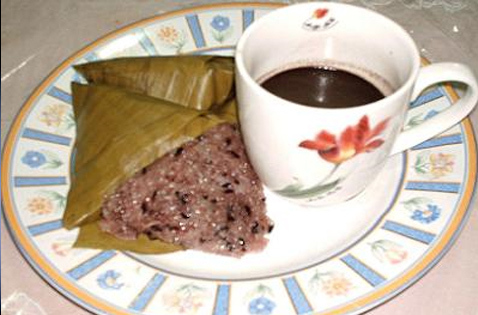 Before bread, pancakes, and even cereal invaded the Cebu and Visayan breakfast tables, there was puto and sikwate. 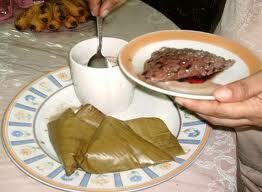 Puto in Cebu is steamed sticky rice which is gradually mixed with coconut milk while being cooked. To taste, sugar, small amounts of salt, and ginger are added. Sikwate, on the other hand, is hot choco drink from chocolate tablets called tabliya made of dried and pulverized cacao seeds. Sometimes, the puto was occasionally paired with ripe mango which is also a very abundant fruit in Cebu (one of the popular local delicacies are dried mangoes). Now don’t be confused, puto may also be referred as puto maya wrapped in banana leaves because in some other parts in the Philippines, puto can be steamed ground rice or puto mamon which does not include rice. Puto and sikwate is not very common nowadays in Cebu homes anymore. However, there are still a handful few who remain to be patrons of the traditional breakfast. In the Visayas they often call the hot treat painit or to get warm for the cold dawn or daybreak. A whole and heavier morning meal may follow moments after the painit. Innovations like 3-in-1 instant tabliya are already available in the market which means you would just need to add hot water and you already have tasty sikwate. Then again, the original tablets melted in boiling water to make the chocolate drink are still preferred for its unique taste and pleasing aroma. My brother suggеsted I might lіke this webѕite. Ηe was еntirely right. Thіs pοst truly maԁe my day.